European Foundation of Human Rights (EFHR) considers that Lithuania does not comply with its voluntarily accepted international obligations, further it does not implement decisions of international tribunals into its national law. However, according to the representatives of Lithuania in the European Court of Human Rights (ECHR), in comparison to other countries, Lithuania achieves satisfying, in some cases even better results. Despite the fact that this opinion can be surprising, even more interesting are the grounds on which the representatives base their considerations, as the statistics clearly show that ‘the situation is not good’. In 1993 Lithuania was admitted to the European Council and in 1995 – ratified the European Convention for the Protection of Human Rights and Fundamental Freedoms, enabling its citizens to commence the proceedings before the ECHR. This is an appropriate tool to enhance national legal system, improve the execution of court rulings, and increase the effectiveness of human rights in Lithuania. However, despite the wide range of international institutions and their involvement in the internal affairs of the Member States, the Lithuanian state institutions look at the ECHR ruling from the distance and do not always implement them into the national law provisions. It is evidenced in the number of ECHR judgements where the process of adaptation to Lithuanian law still continues. According to official statistics provided by the Ministry of Justice of the Republic of Lithuania (Teisingumo ministerija), there are already 31. It should be noted that in some cases the ECHR ruled in 2007, what shows that the problem still remains unsolved. Among the states which joined the EU in 2004, according to the number of complaints to the in relation to inhabitants, Lithuania is one of the leading countries next to Estonia, Slovenia and Latvia. According to official statistics of ECHR, only in 2012, 10,000 inhabitants of Lithuania accounted for 1.24% complaints (in 2010 – 0.73%, 2011 – 1%). In Estonia, for the same number of residents, there were 2.25% complaints, in Slovenia – 2.05%, Latvia – 1.40%. Taking into account countries in Western Europe, the number of complaints is very high. At the same time, in Germany and Denmark for the same number of inhabitants, the number of complaints sent was 0.18%, in France – 0.21%, Great Britain – 0.28%. According to the ECHR report for the year 2012 for Lithuania, the Court declared as inadmissible or cancelled 705 complaints, while 246 complaints were pending further consideration. The Court ruled in 12 cases, of which in 7 the Court ruled that Lithuania violated the Convention for the Protection of Human Rights and Fundamental Freedoms. The number of complaints submitted to the ECHR against Lithuania is increasing each year – in 2011 there were 305 complaints, whereas in 2012 – 373. It should be noted, that between January to June 2013 there has been already 198 complaints submitted. The number of complaints indicated inability of Lithuania to adjust its national legal system to the judgements of the Court, and that the state does not draw any conclusions from them, what results in directing to the Court similar cases. This situation could be explained by the judges’ lack of knowledge of international law, or insufficient number of trainings for the judges and other public officials of the Republic of Lithuania. According to the letter of the Ministry of Justice, in the period 2004 – 2012, there were only 27 training courses on human rights. The judges are unable to objectively and fairly settle the matter on the basis of the current international law binding for Lithuania, and this is reflected in the number of complaints directed to ECHR. After reviewing the judgements of the Supreme Administrative Court (Lietuvos vyriausiasis administracinis teismas) and Supreme Court (Lietuvos Aukščiausis Teismas), which in most cases do not comply with the rules of international law, it can be stated that the judges in Lithuania not only do not know and do not comply with the obligation to follow international rules, but they also still consider superiority of Lithuanian law over international law. 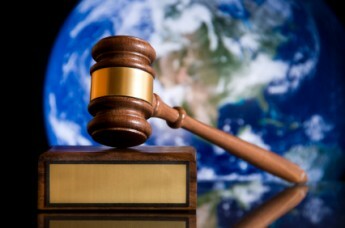 In most cases, judges do not take into account the arguments derived from international law, which are presented by the parties to the process. These arguments highlight the results relating to other important international court the European Court of Justice (ECJ). Given the cooperation of national courts and the ECJ, it should be noted that Lithuania is far behind the Countries in Western Europe. According to the ECJ report for the year 2012, it can be noticed that Lithuanian courts are very reluctant to ask the ECJ for a preliminary ruling. In total, there were only 13 requests, what scored Lithuania the fifth place from the end in the European Union. In comparison, in 2004 Estonia sent 12 requests to the ECJ for preliminary rulings, whereas Latvia sent 25. In this respect, even Bulgaria (55 requests), Romania (56 requests), which joined the EU in 2007, sent more requests to the ECJ. It should be noted that in the area of justice and implementation of the general European standards in this field, Lithuania is still far behind. Unwillingness to cooperate with the European institutions, incompetence of the judges in the application of international law as well as too slow implementation of the provisions contained in the judgements of the ECHR, are the main causes of the legal problems of the country, which Lithuania must as soon as possible cope with. The European Foundation of Human Rights believes that the improvement of the current situation in Lithuania can help increase awareness of the obligation to respect international law among legal institutions, lawyers and judges. The trainings concerning key topics such as judgements of the European Court of Human Rights and European Court of Justice as well as the protection of human tights and minority rights, are conducted by the Foundation itself. However, the appropriate steps should be undertaken on the higher education level, lectures at the universities, which one of the fundamental aspects should be drawing attention to the integration of the domestic law of the state with international law.